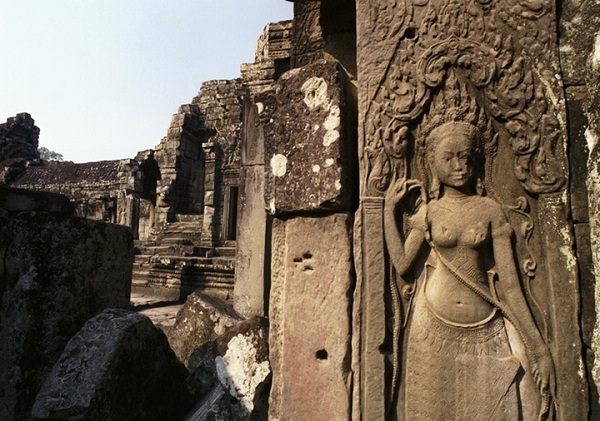 The lush jungle surrounding Bayon Temple camouflaged its location in relation to other structures at Angkor, so it was misled about the true compound it belongs to. 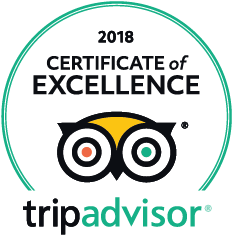 Therefore, that Bayon Temple stands in the very centre of the ancient capital of Angkor Thom was not universally acknowledged for such a long time. 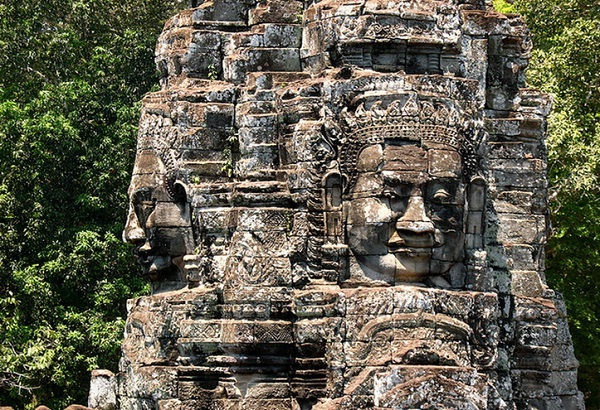 Dating from the late 12th century, Bayon Temple brims with a distinguishing feature of about 200 stone massive faces looking in all directions. Known for its representing the intersection of heaven and earth, Bayon Temple remains one of the most enigmatic temples of the Angkor complex. The temple is oriented towards the east with a road leading to directly from the gates at each of Angkor Thom’s cardinal points. 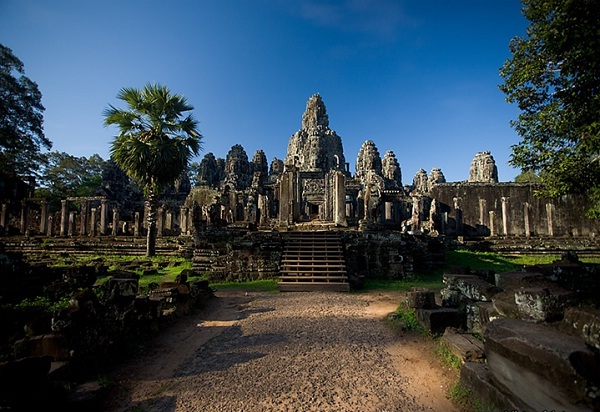 Bayon Temple itself is surrounded with two walls which serve as outdoor large galleries exhibiting an extraordinary collection of bas-relief scenes of historical and mythological events as well as images from daily life activities of the Angkorian Khmer for almost one thousand years. In total, there are approximately 11,000 sculptural figures covering the walls of 1.2 kilometres in length. The details were vividly and complicatedly carved from stone walls without any sort of epigraphic text. 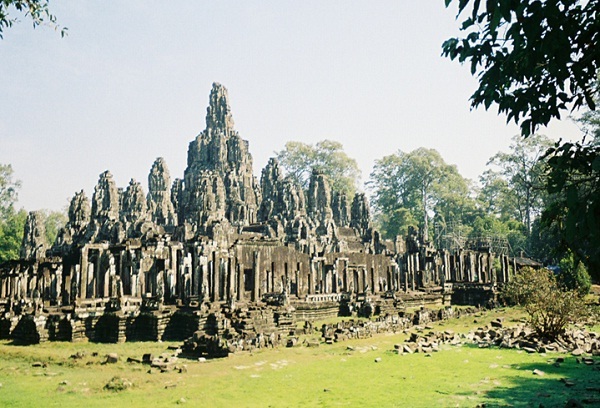 A peculiarity of Bayon Temple is the absence of an enclosing wall. 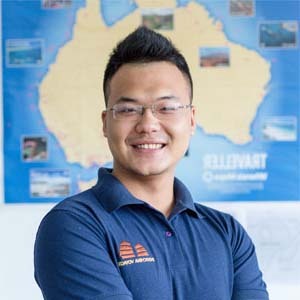 A number of theories explaining the mystery behind those smiles – like the case of Mona Lisa by Leonardo da Vinci, have been formulated, and the most generally accepted is that King Jayavarman VII perhaps imagined himself as a god-King ruling in the name of Buddha. 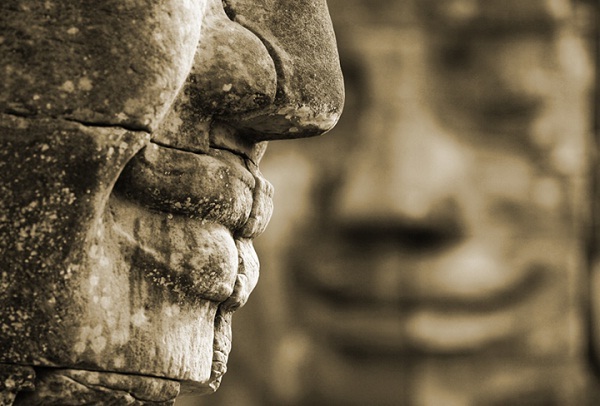 The characteristics of this face – a board forehead, downcast eyes, wild nostrils and thick lips – superbly combine to reflect the famous “Smile of Angkor”.